It will happen one day. Until then, there are plenty of great places on the web to learn about dinosaurs. That said, let’s tackle the meat of the matter. Snively, E. and Russell, A.P. 2007. Functional Variation of Neck Muscles and Their Relation to Feeding Style in Tyrannosauridae and Other Large Theropod Dinosaurs. The Anatomical Record. Vol. 290: 934-957. This paper is just an awesome testament to just how much we can learn about animals by studying their skeletons alone. The authours studied the cervical (neck) vertebrae and skulls of 15 theropod dinosaurs from 3 major clades. 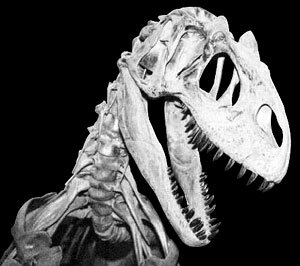 Tyrannosaurus (Nanotyrannus as well, but it was placed as a probable junior synonym of Tyrannosaurus). It should be noted that, where possible, multiple species within a genus were used. The authours studied the muscle scars left on the cervical vertebrae and rear skulls of every specimen. By carefully studying the location of each scar, and comparing it to the Extant Phylogenetic Bracket (EPB) – which would be birds and crocodylians – it was possible for them to determine which scar belong to which neck muscle. Neater still; the size of a muscle scar, at its origin, is proportional to the cross sectional area of that very muscle (at least when comparing homologous muscles). What does it all mean? Basically, the authours were able to deduce (with reasonable accuracy) the overall size of the muscles found in these theropod’s necks, just by measuring the size of the muscle scars left on the cervical vertebrae themselves. Each one was a “poster child” for a particular feeding method. Tyrannosaurs (especially Tyrannosaurus) employed a puncture and pull method that required strong muscles for pulling the neck up and sideways (somewhat similar to the feeding method used by crocodiles when on land). Neoceratosaurs showed strong ventral musculature suggesting strong downward force was being used. They also show strong dorsal and lateral musculature, which suggests that they employed a “hit and run” method of attack that would be similar to white pointer sharks, or Komodo dragons. Last, but certainly not least, Allosaurus and its ilk were more similar to the speedy dromaeosaurs (Deinonychus, Velociraptor) in hunting style. Strong ventral musculature helps to corroborate previous studies (such as Emily Rayfield’s FEA study) that Allosaurus used its head like a hatchet, and slammed it down into prey animals. The long, strong forearms were probably used first to hold prey and brace it for the killing strike. All in all, this was a fascinating paper. One with the potential to change all future reconstructions of these animals. So keep your eyes tuned to Discovery Channel, as I’m sure they are bound to make a special that will incorporate this data (they always do).